Top and base coat. This topcoat can be used as a two-in-one top and base coat. It will give any nail polish a beautiful, glossy finish. What Makes Kester Black Top and Base Coat Nail Polish So Special? 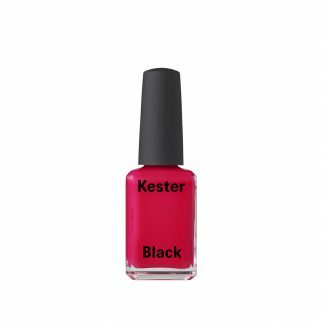 Kester Black Top and Base Coat Nail Polish is a clear nail polish that strips out a lot of bad stuff. While no nail polish can ever be fully free of chemicals, their 10-Free™ brand does not contain formaldehyde, toluene, DBP, camphor, formaldehyde resin, xylene, parabens, fragrances, phthalates and animal derived or tested ingredients. Top and base coat is a clear nail polish. This topcoat can be used as a two-in-one top and base coat. It will give any nail polish a beautiful, glossy finish. Kester Black has also never used ingredients ethyl tosylamide, triphenyl phosphate or xylene. None of their skincare contains any nasties like palm oil, parabens, sulfates or petrochemicals. Their skincare range is made using certified organic ingredients and contain 97% + natural ingredients. Gently wipe down each nail with nail polish remover to eliminate any oily residue prior to painting. To achieve a perfect manicure, glide brush over each fingernail, coating the nail surface from base to tip with Kester Black Top and Base Coat Nail Polish. For best results, apply a Topcoat to seal and prolong wear. Ethyl Acetate, Butyl Acetate, Nitrocellulose, Adipic Acid/Neopentyl Glycol/TrimellItic Anhydride Copolymer, Acetyl Tributyl Citrate, Isopropyl Alcohol, Polyvinyl Butyral, Trimethyl Pentanediyl Dibenzoate, Benzophenone 1, Dimethicone, D&C Violet #2, Heptane, Ethylhexyl Salicylate, Ethylhexyl Methoxycinnamate, Surcose Acetate Isobutyrate, Alcohol Denat, Perfluorodecalin, Trimethylsiloxysilicate.